Over the course of the past 3 months I have been working to complete our LEED for Homes submission to the USGBC (United States Green Building Council) in hopes of achieving a Platinum certification. We are well over the Platinum threshold and are currently projecting that we will exceed it by 27 points. Once certified, we will be the 6th (maybe 7th) LEED for Homes Platinum project in the state of Tennessee. Furthermore, we will be the first LEED platinum project in the University of Tennessee's building stock. While the documentation itself is more or less complete, we have been working on a large publication to accompany our submission. We hope that our efforts can serve as a case study for others and the book will be available for purchase/ download in the coming months! Below you will find some draft spreads of the 264 page document. Enjoy! PS. Check us out on ArchDaily. The big times! The fist section deals with the story and background of the New Norris House. This includes history, design objectives and strategies, and process work. 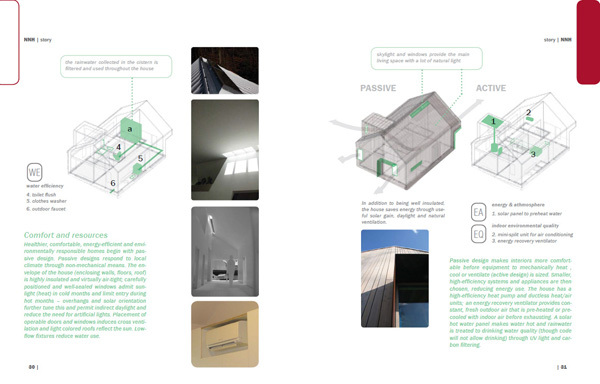 The second section is the home's user manual. 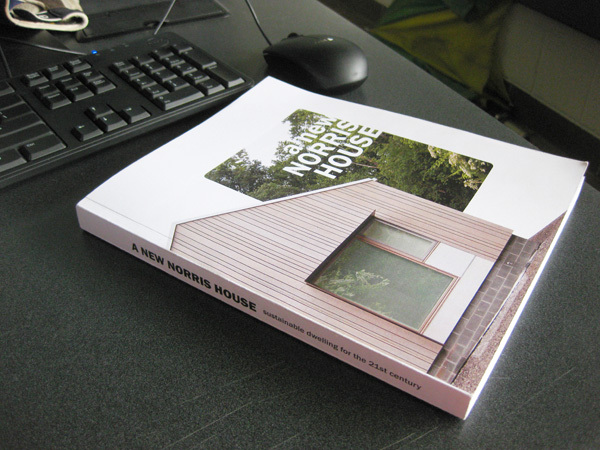 It contains specific information about the operation of the home's systems (rainwater, solar hot-water, HVAC, etc), care and maintenance schedules (floor, siding, landscape, etc) as well as information about lifestyle choices (recycling, composting, purchasing greenpower, etc). 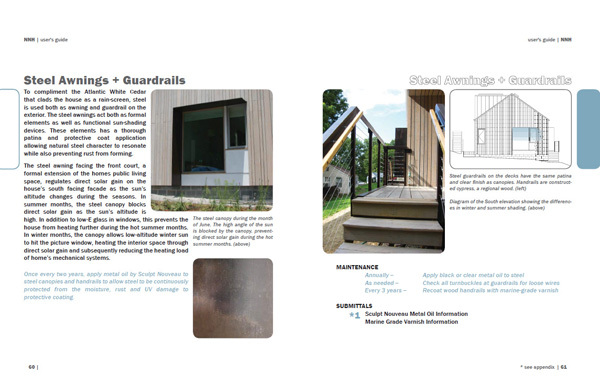 The third and final section is a detailed description of every LEED point acquired by the project. 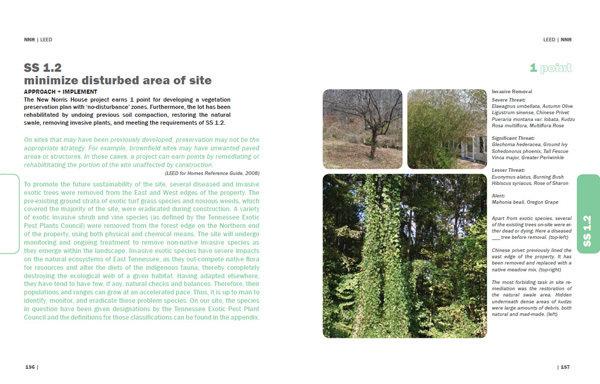 In the credit shown above, information is given about removed exotic species and efforts to re-mediate the site. 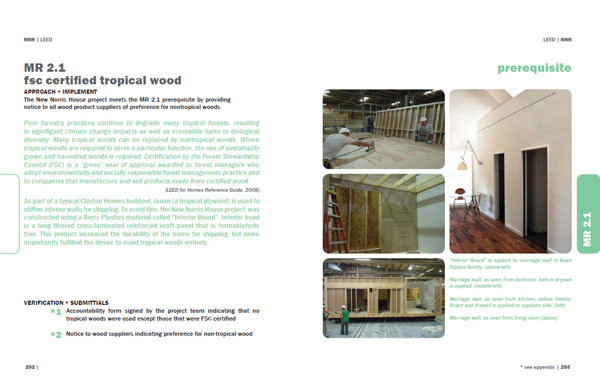 This credit details efforts made to avoid the use of tropical wood (in our case, lauan). 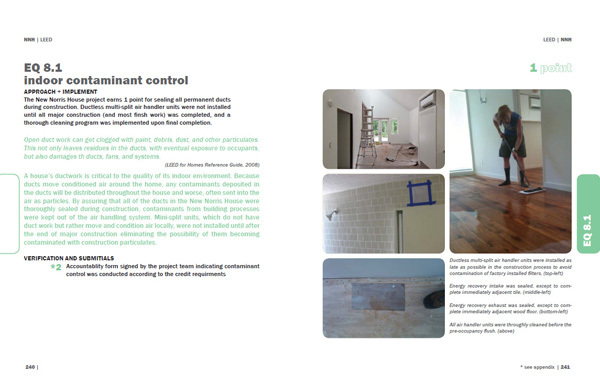 The above credit details efforts made to control contaminants during the construction phase.